Batman interrupts a thief breaking into a storefront. A fight ensues, and the thief gets away. We soon learn the thief is the sister of Kyodai Ken, Naoko, and she blames Batman for Ken’s death. Naoko is soon visited by ninja sent by her master, Furukawa. They inform her Furukawa has declared her mission is forbidden, but should it succeed, the honor will belong to Kano, not her. We assume from the photo she carries that she and Kano were a romantic item. Batman next encounters Naoko when she is disguised as a mafia thug. Again, she gets away. Back at Naoko’s apartment, Kano shows up, hoping to talk her out of her mission. He fails. 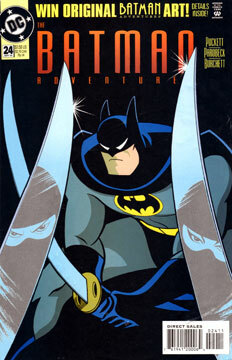 Later, Batman is attacked by a ninja, who turns out to be Kano. Naoko arrives, sees Kano attempting to protect her from going through with her mission, and the two join forces against Batman. Batman tries to explain he did not kill Kyodai Ken, but his assailants won’t hear it. Finally, Furukawa arrives, and the fight ends. He says he will return to Japan with Naoko and Kano, and they will be “dealt with.” It seems he owes Batman a debt. Batman offers to cancel that debt, in exchange for the Naoko and Kano’s lives. Furukawa agrees. Full disclosure here: the Kyodai Ken episodes are not among my favorites. Not sure why. The character did nothing for me. Seeing that story get continued here did nothing for me, either. It’s not particularly bad. It simply didn’t hold my interest. And there are some questionable things, too. Why does Naoko parade around in disguise to engage Batman? Is she hoping to kill him when dressed as a button man? Would she keep trying it until she gets it right? Also, in the end, Batman tells her the two of them are not so different, and in the final page we seem him reminiscing over a photo of Talia. I admit, I don’t get that. Excellent, as always. Makes a dull story worth reading. Just a bunch of ninja running around in black pajamas.